James R. Randall (1839-1908), American journalist and poet. Best remembered as the author of the state song "Maryland, My Maryland" after learning of the death of his friend Francis Ward by the 6th MA Infantry in the Baltimore riot 4/19/61. TB kept him from enlisting in the CSA Army but he did serve in the CSA Navy as Flag officer's Secretary (aboard C.S.S. Yadkin) in Wilmington, NC 2/6-8/64. 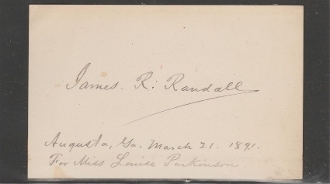 Card Signed (CS) dated 3/21/91, Augusta, Ga. for Miss Louise Parkinson. Mounting residue reverse side corners, otherwise very fine and scarce autograph.